Our 2013 season is almost full! If you haven’t done it yet, now is definitely the time to plan that fishing trip you’ve been talking about! We’ve been booking up dates for 2013 since last summer and we’re pleased to say that it’s looking like a very busy season is ahead. Be sure to call soon to ensure that you don’t miss out! To make it easy here’s the 2013 Trip Calendar! In our constant effort to improve our fishing program we’re adding some great new technology to every boat in the fleet this summer. 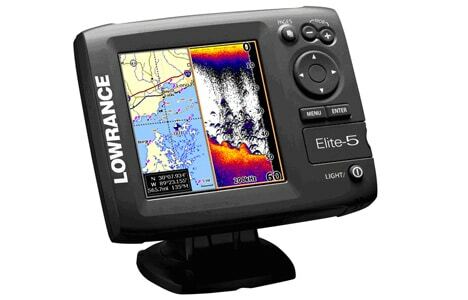 The Lowrance Elite 5 Combination Fishfinder Chartplotter is an easy-to-use tool that will assist QCL anglers in many ways. It features a built-in chart of our fishing area showing in detail all of the points and bays you’re looking for. The built-in GPS is a valuable navigation tool, especially when we’ve programmed in all of the key routes, waypoints and fishing hotspots throughout the fishing grounds! It’s wide coverage sonar capability shows more bait and fish, yet will still be accurate enough to show true depth, as well as bottom structure and fish holding near or on the bottom. QCL Dock Manager and Head Guide Ryan “LongJaw” Ashton heads our team of fishing pros and is always happy to share some great fishing advice! No – we’re not talking about fishing with the buddy who left the drink cooler on the dock, forgot his license in his room, and knocked your fish off with the net! We’re talking about Dummy Flashers – hooking up a flasher to your downrigger cannonball, instead of running it on your main fishing line. This setup allows all of the benefits of a flasher without the drag in the water which takes away much of the play of a fish. When trolling with downriggers, flashers are used to attract salmon from greater distances where he is more likely to find your bait. A rotating flasher gives off a flash of reflecting sunlight, and produces a vibration that is picked up by a salmon’s lateral line. This flash and “sound” mimics the actions of a feeding salmon, and brings nearby fish closer to investigate. If flashers have a downside, it is that they produce drag in the water against a fighting fish, often giving an undesirable feeling on the rod. I even wondered if the fish can use this as leverage to pull a hook out of their mouth! This is where the dummy flasher setup really shines! Connecting the flasher directly to the cannonball completely eliminates the drag when playing the fish. All you have between the rod tip and the fish is a swivel and a hook – nothing to slow him down or impede the action. It is amazing to feel every headshake! Another advantage is you will not lose your flasher if a fish breaks off – it always remains attached to the cannonball. Our custom downrigger setups at QCL are ready to fish with this technique. Using the flashers and special lines included in your tacklebox, simply connect one end of the dummy flasher line to the narrow end of the flasher, and the other end to the eyelet of the cannonball. Then carefully lower the ball and flasher into the water. Let your bait out around 8 – 10 feet behind the boat, and connect the fishing line into the release clip. The clip is already set at the proper distance above the ball to prevent tangles, but it is important to lower the entire rig at a controlled speed to avoid problems – don’t let it free fall! I am completely convinced that flashers are effective at bringing fish in towards your gear – I can recall numerous occasions when salmon chased my flasher right up to the surface as the downrigger ball was retrieved. I was able to drop my lure into the water in front of the fish, and watch them hit right before my eyes – what a rush! If you want to give this flasher setup a try, just ask us our dock crew for more information. We’ll get you geared up properly, and know you’ll love fishing with a dummy! Look for our banner in downtown Calgary! The response to our direct flights from Calgary in June has been very positive. Alberta anglers like having the ability to leave Calgary after breakfast and be hooked up with a Tyee at Bird 2 before lunch! We are getting a lot of enquiries from our Alberta guests who would like to fly direct to Masset from Calgary. We are always trying to improve our program and we have come up with a great solution. For this summer consider a couple of dates: June 7 – 10 and June 10 – 14. We can provide direct service between Calgary and Masset with our chartered 737 on these 2 trips. The response has already been so great we may need to look for additional dates. Be sure to give us a call to find out more and reserve your seats! Do you use tripadvisor.com in your travel planning? We’re finding more and more of our guests use online services like tripadvisor.com when planning their travels. If you’ve ever used it in your own research you know that it can be a valuable resource in considering places to stay and things to do. QCL has a listing on their site and if you’re so inclined, please take a moment and share your thoughts! We’d appreciate it! To visit our page on Trip Advisor click here.